After I graduated from college, my first job was as a technical writer for a fast-growing enterprise software company. This was the 90’s, when the software industry was just beginning to pick up steam. In those early, heady days, people would buy a new software package wrapped in nothing but a cardboard box containing a CD and a thick paper manual, which claimed to explain how to install and then use the software. A few brave souls might read those manuals cover to cover; most, however, would skim them and then toss them aside in frustration because of their inscrutable techno-babble. The company for which I worked was one of the first to think more creatively about instructional design, exploring how visually-driven formatting, images and icons, along with more personable language, could not only entice someone into reading a manual, but also help accelerate their understanding. Writing like this often took more effort, rather than less. But that approach helped readers’ eyes move from line to line, instruction to instruction, so that their thoughts could focus on their task’s outcome, rather than the process they were following to get there. I became a technical writing Jedi Knight, helping readers glide toward technological empowerment—often barely aware of the journey they took to got there. I found myself asking why a book born out of such promising beginnings, which is still helpful and certainly original, falls rather short on delivering on its fundamental promise: to make rich theology more accessible. As a Christian and an aspiring writer, though, I felt conflicted over the amount of creative effort and thought that went into books that might help solve someone’s desktop management problems, but did nothing noticeable for anyone’s soul—books that would be rendered obsolete the minute a software version shipped. I soon moved into other communication and marketing roles in high tech, where I worked with every emerging digital communication method the Internet and business conspired to create. From PowerPoint to digital whiteboard training and infographics, the Information Age has become an increasingly visual one. As formatting and usage guidelines have developed for each new medium, they have become powerful tools to generate understanding and insight in ways that were literally impossible just decades ago. The church has been relatively slow to realize the potential of these new digital communication methods to teach spiritual truth in fresh ways. That’s why I was particularly excited to get my hands on a copy of Visual Theology: Seeing and Understanding the Truth about God, coauthored by Christian blogger Tim Challies and communications pastor Josh Byers. The book’s website summarizes it as “the first theology book that belongs on the coffee table,” while the back cover states that its goal is to “present the concepts and the principles of systematic theology in a fresh, beautiful, and transformative way.” Born out of a project begun at Challies’ popular blog, this was the first work I had heard of that was attempting to use modern infographic methods to communicate weighty theological truth. Having used these methods successfully in my professional work, I couldn’t wait to see how this book might do the same in my spiritual life. At first glance, readers of more formal systematic theology texts by authors such as John Frame, Alistair McGrath, or Wayne Grudem will note that the structure and topics covered in Visual Theology differ significantly from those of similar works. In his introduction, Challies states that Visual Theology is “a book about how to live the Christian life and how to train yourself not just by believing the right doctrines and truth but by putting those beliefs into action.” He structures the book around what he sees as the “four pursuits or disciplines,” which comprise “all that we do and all that we are as Christians”: growing close to Christ through the spiritual disciplines, understanding His work on our behalf, becoming like Him, and living for Him. This emphasis means that topics that other systematic theology works cover at length, such as the nature of the Trinity or the attributes of God, are not covered in great detail. The content might be more accurately described as a primer on Christian discipleship, rather than a true volume on systematic theology. It’s this emphasis on application of particular doctrines, rather than on their description, that makes Visual Theology a practical counterbalance to more traditionally structured systematic theology works. Challies writes in the voice of a pastor—the simple and personal style that has become his trademark—as he walks the reader through the essential truths that should guide every Christian to maturity in Christ. I especially appreciated Chapter 3, titled simply “Relationship,” where he details how the Bible (God speaking to us) and prayer (our speaking to God) are essential to our growing into a deep relationship with Jesus. In fact, Challies’ work consistently reinforces the idea that relationship and doctrine ought to be intermingled. In the second section of the book, for instance, Challies frames understanding the work of Christ around knowing the historical narrative of Scripture (“The Drama of God in Four Acts”) and understanding the benefits of knowing sound doctrine. “Doctrine leads to love,” Challies states. “It is meant to amaze you with the sheer power and magnitude of God.” (While Challies argues that doctrine benefits us, however, the only treatment of “truth in action” is a study guide, which was not actually included in the book. According to Challies’ website, it will be available sometime this summer). The third section of the book then explores how a deepening relationship with Christ will lead to a growing desire and need to become like him through putting off sin and putting on Christ’s righteousness. In the final section, Challies describes how we live out our relationship with Christ in the world through our vocations, relationships with others, and stewardship of our resources. Of the graphical elements designed to complement the text, only two can be properly called “infographics” (i.e. an image using stylized pictures and minimal text to convey layers of data at one time), and they’re terrific. On pages 50 and 51, Byers uses the periodic table of elements as a template to list and describe the 66 books of the Bible, communicating in several seconds what could take a Sunday School teacher an hour to review. On pages 136 and 137, meanwhile, he uses a type of infographic known as a “word cloud” to depict the “one anothers” of the New Testament, with circles scaled to represent the relative number of times each command occurs. The “Love” command dwarfs the rest, which makes the point impossible to miss: “The greatest of these is love,” indeed. While God speaks broadly to all humanity through his creation and through our consciences, he also speaks uniquely and personally, and he does this through the Bible…Where creation and conscience provide general knowledge of God’s existence and God’s law, the Bible provides clear and specific communication about his nature and his plan. The graphic opposite this text, however—four speech balloons, each of equal size, two hollow and two solid—seems to be stating something rather different. Because of their visual similarity, one might infer that all four methods of God’s speaking are essentially equal, or that there is a commonality between the Bible and universal law, between conscience and creation. Whatever the image’s message is, it feels out-of-sync with Challies’ actual exposition. In other places, the choice to publish the book as a paperback rather than a true hard-cover coffee table book constricts some of the images and obscures their meaning. There are also a number of formatting missteps where graphics are oddly sized or misplaced, or chapter and heading names at the bottom of the pages aren’t displayed consistently. As a result, I found myself asking why a book born out of such promising beginnings, which is still helpful and certainly original, falls rather short on delivering on its fundamental promise: to make rich theology more accessible. One of the book’s most successful images—the “One Anothers” infographic that appears near the end of Chapter 9—hints at a possible answer. Challies’ opening assertion in the chapter is that “the Bible takes special care to address [relationships] in which each person plays a different role and especially in which God means for there to be a pattern of leadership and submission.” He thus spends most of the chapter describing the different types of relationships where the Bible identifies these dual roles at work (e.g. governments and citizens, bosses and employees, pastors and congregations, husbands and wives, and parents and children) while an accompanying diagram depicts these relationships. While Challies emphasizes submission, however, the “One Anothers” infographic argues for a different framework for how the Bible views relationships. 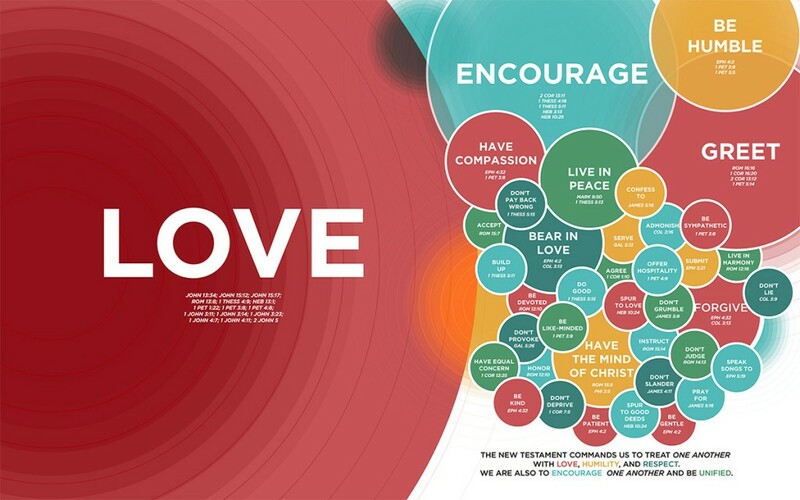 In it, the circle representing Ephesians 5:24 ‘s “Submit to one another” is dwarfed by the many verses referencing “Love.” (In the poster version of the image, submission is literally subsumed by love.) Challies’ text, in other words, sees the specificity with which the Bible describes the leadership/submission dynamic of certain types of relationships as an indicator that this dynamic has uniform or universal significance for relationships as a whole, while Byers’ infographic does not. The greatest relationship dynamic, according to the infographic—and the many Scriptures it depicts—is actually love. When considered together, Visual Theology’s imprecise framing and numerous formatting and illustration issues hint at several strategic errors that may have been made as this book was being conceptualized. Prior to the publication of Visual Theology, the design of most of Christian non-fiction books had been overwhelmingly driven by the layout of text, with only occasional diagrams or images subordinated to it. Consequently, the style and formatting guidelines for designing and publishing a text-driven book—and even the people and processes required for the work—have been relatively standardized. At the same time, many of my author friends have quietly described to me the ways a book’s “big idea” can be hijacked by a modern publishing juggernaut that puts branding, cover art, and social media hashtagability ahead of the actual content. In this case, whether in terms of text and visuals or publisher and author, Visual Theology’s full potential is stifled by multiple levels of relational imbalance. There’s no question that, as an innovative approach to teaching theological truth, Visual Theology is a “category creator.” In the language of technology, it’s a 1.0; it models a new and modern way to teach timeless truths from the oldest of stories. But it succeeds more in the idea than the execution. As a result, it challenges us to remember Jesus’ admonition in Luke 5:36-38 that new wine requires new wineskins. The good news of the Gospel is worthy of every creative means of proclamation the modern world has placed at our disposal. But because it is such good news, it is worthy of our most careful, intentional effort to use those means thoughtfully and well. When we do, our audience will see the truth in the fullness of its beauty, and be blessed. Rachael Starke lives with her husband and three daughters in San Jose, California, where she has worked for the last 15 years as a technology sales and marketing manager and consultant to the high tech industry. An unabashed foodie and aspiring writer, her most popular writing genre to date are her tweets, which have been read on the Jimmy Fallon show.